We have a bunch of pairs of tickets to see The Purge: Anarchy at the Rave University City on Tuesday, July 15th at 7:30pm. To enter, email us, with your name and tell us why you are looking forward to this sequel! Winners will be chosen at random, only one entry per household please. The first one was bad. The sequel looks like it may be better!! looking forward to this sequel because I didn;t see the first one. Saw the first movie, I kind of want to see how the next one turns out. The concept of a full day of complete lawlessness is genus! 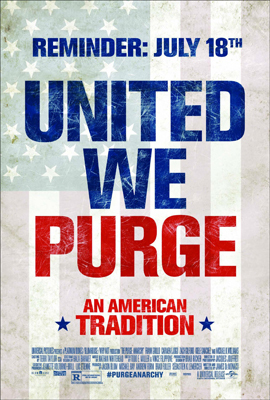 I didn’t know what to expect when I saw the 1st Purge, but I was thoroughly pleased. Looking forward to seeing how they follow up! I want tickets because I saw the first one and it was good. So this one looks like its even better. Been waiting to ser it.